Minitokyo »	Yotsubato! 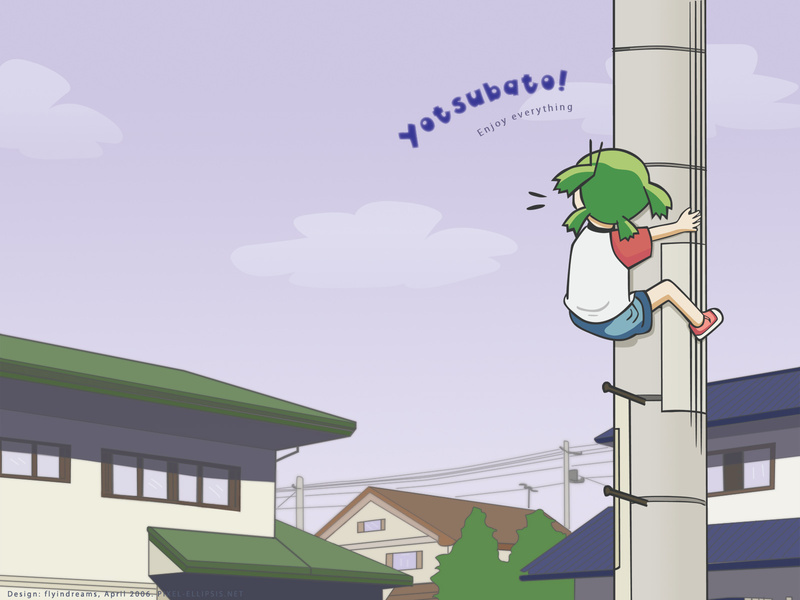 Wallpapers » Yotsubato! Wallpaper: Reach! Not going to blab too much about the "meaning" this wall because you usually read my walls so well. Best wishes to another awesome April baby for being one of my closest waller friends, always eager to give out wall advice, share in feeling the ebilness, and... one of my favorite wallers :D Made sense to do Yotsuba for her, since she immortalized Yotsuba in so many awesome walls... Not to mention Yotsuba is just such a sweet little girl, she wormed her way into my heart and refused to leave >_< Thanks bunches to fuku for uploading and sharing Yotsuba with me :D It's just such an terrific series, anyone who hasn't read it should definitely check it out! 5/5/06: Touched up bg windows, clouds, outlines, etc. I'm not completely happy with it, but I guess it's the best I can do without making an even bigger mess of things. Must remember in future: rushing walls = bad! your getting good at setting up structures..
is the little dude fixing the power lines? Aaah! This is too cute! The vectoring is really well done and I like how the pole and the gilr are more bright than the buildings in back. Make then stand out more. my wallpaper for the next 3 days. Brings a smile to my face. nyaaaaaaaaaaaaa, i love this wall *hug hug hug tightly*. That is such a super cute wall i've ever seen here >.<, and an amazing skill of vectoring too. Always do love this kind of color and this kind of wall nyaaaa, cant stop loving it. Since the wonderful totoro of Tatekane is on my desktop now >_<, this one will sure be the next *cry* i luv it. WOOOOOOOW ! It's awesome ! So cleaaan :D and vector is sooo great :D fav fav fav fav ! not to mention the very nice look to it as well. I really like it. :) It's simple and clean and the sky makes me feel really...nice. Realy good idea :) This cute one is my fav wallie of week.